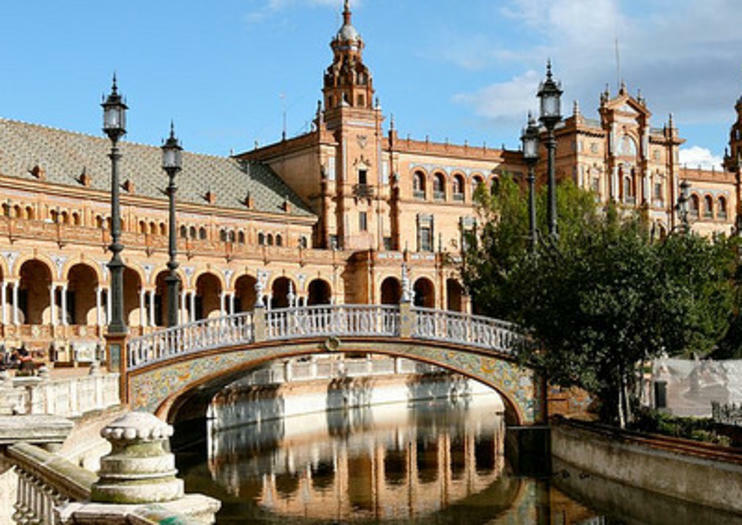 With three days in Seville, you can explore top attractions, walk its medieval streets, and venture outside the city to experience additional wonders of Andalucia. Here are some ideas for how to spend three days in the region’s biggest city. Start your day off with a skip-the-line tour of Seville’s most famous attraction, Alcazár of Seville. Wander through the fountain-filled gardens, featured in Game of Thrones, while soaking up the Catholic and Moorish details of the UNESCO World Heritage Site. The city is packed with things to see, with plenty of options for seeing them. Take a walking, biking, or Segway tour of the historic city center, or if you’d prefer to go solo, climb aboard the hop-on hop-off sightseeing bus to tour at your own pace. No matter what your method of transportation, don’t miss Plaza de España and the Seville Cathedral (Catedral de Santa María de la Sede), the largest Gothic cathedral in the world. Refuel after your day of sightseeing with a tapas and wine tour. You’ll sample some of the city’s best bites paired with local sherry or manzanilla. Now that you’ve seen the highlights, take a day to dive deeper into the history and culture of Seville by pursuing your interests. Relive your favorite scenes from the hit HBO series on a Game of Thrones tour, explore the city’s musical history, spend the day wine tasting, or take a cooking class to learn how to prepare your favorite tapas. History buffs might want to head to the outskirts of town to visit the ruins of the Roman Necropolis Museum, while those looking to relax can soak in the pools of Aire de Seville, a Moorish-style hammam. Once the sun goes down, book a table at one of Seville’s many historic tablaos for a night of flamenco—a combination of dance, singing, and Spanish guitar that originated in Andalucia. With so much to see outside of Seville in Andalucia, the biggest challenge is narrowing it down. You could head to Granada for a skip-the-line tour of the Alhambra, explore the white villages (including Ronda), go sherry tasting in Jeréz, stand upon the Rock of Gibraltar, or even visit a different country with a trip to Tangier in Morocco. Once back in Seville, let loose on your final night with a pub crawl to some of the city’s best nightlife hot spots. Head out on your own, or join a local on a tour for a hassle-free night of drinks, dancing, and making new friends. Venture to some of Seville’s most tantalizing and traditional tapas bars on a 3-hour culinary tour of the city with a gastronomical guide. Gain fascinating insight into Seville’s rich culinary heritage as you visit three of Seville’s most established eateries; sample sweet sherry wine, sizzling king prawns, succulent oxtail and ripe tomatoes as you pleasure your palate with Spanish specialties. Refresh with fine local wine and crisp beers as you eat your way around the sumptuous city.